CONTRADA PETRARO, Sicily — Spring is ending and summer approaches. The grass is now long, finished growing. For us, it's time to scythe. This is a beautiful, and slightly sad, time of year for my wife and me, when the fields of grass and flowers on our 3 acres of farmland in the mountains of northern Sicily must be cut. We would prefer to let them live on: There are deep pink French honeysuckles, purple thistles, yellow dandelions, pale pink and white acanthus, and wispy and lazy grasses. But that's not prudent in the dry Mediterranean summer, when fires are an annual threat and long grasses fuel flames. The idea of our olive, almond, ash and fruit trees — not to mention a hundred grape vines I planted this spring — catching fire is a ghastly one. 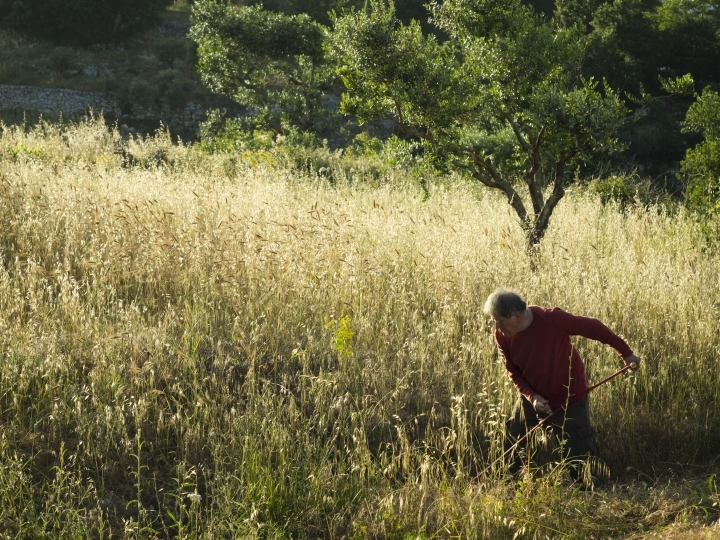 So, off into the fields we go to scythe — an ancient method of cutting grasses that few people do anymore here in Sicily or elsewhere. Landowners here have many ways to prevent fires from raging across the countryside. 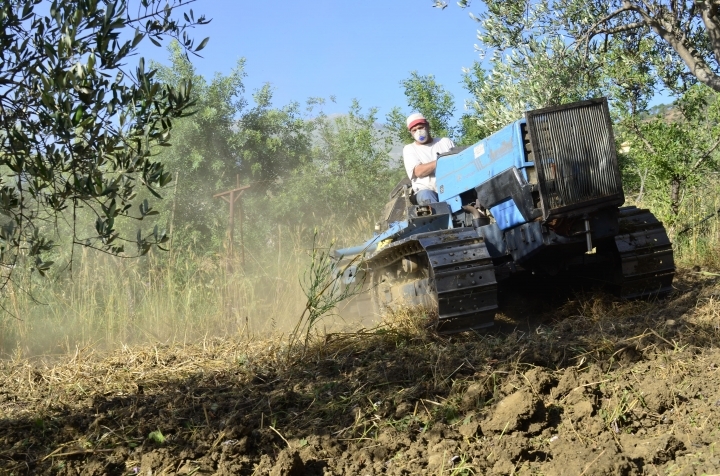 Some use a tractor to "pulire il terreno" ("clean the land"). Many take out weed whackers, masks and gasoline cans to tackle the grasses. Old-timers used to simply pull plants out by the roots and cut grasses by sickle and scythe. 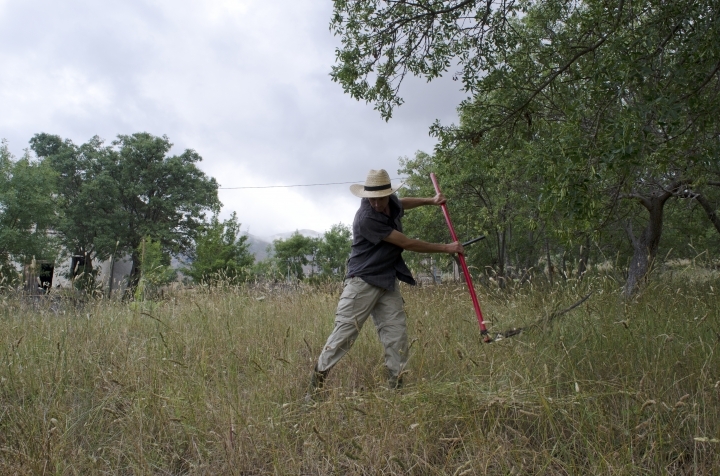 This is our second year of "cleaning up" our land — and we do it the old-fashioned way. I chose to scythe because that's how my father, Bob Burdeau, has been cutting his grass in Puglia for years. He swears by it, both because he dislikes using machines but also because there is something therapeutic in scything. On cool spring evenings, we talked by telephone about the differences between scything and using a weed whacker. "With a weed whacker, the aim is to get the work done," my father told me. "And you get it done as efficiently as possible ... Because you're trying to earn money, you're trying to do something, and you've got other things to do." "But it's not as efficient really because you have to get your machine fixed all the time; you've got to buy gas and additives for the gas," he said. "But the sensation is that you're getting it done. And when you're doing the scything, you're not really in that same state of mind. You're in another state of mind." Surprisingly, I found many local farmers of the same mind — even though they use weed whackers and tractors. I helped a friend cut grass in a beautiful olive orchard inside a valley that runs into the Tyrrhenian Sea. "This is the part of the work I hate the most. I despise weed whackers," my friend said. And sure enough it was stressful: Both machines we used broke down, starting and stopping, needing a mechanic's hand. Clothes got ruined. We smelled of gasoline. I had to wear a mask, safety goggles and ear muffs. After using a weed whacker for a while, your arms are numb from the vibrations. I have a weed whacker, and I might buy gasoline and raze the edges of the property to make solid firebreaks. 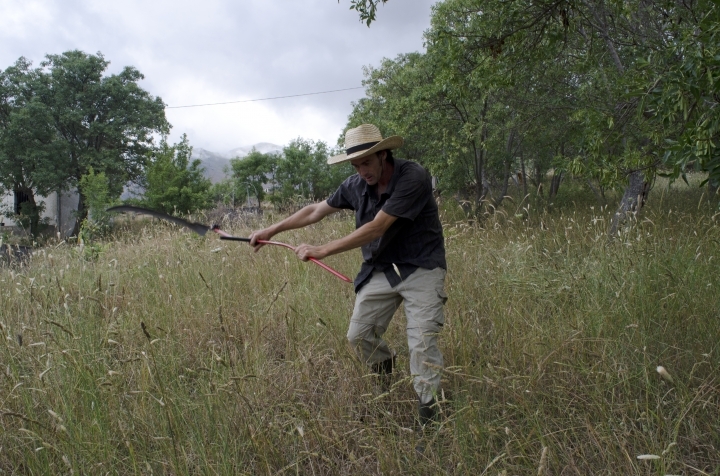 But other than that, our grass is being cut by an Austrian scythe I bought last year from a hardware store in nearby Castelbuono. I am also using a pair of long clippers for cutting around trees and rocks. 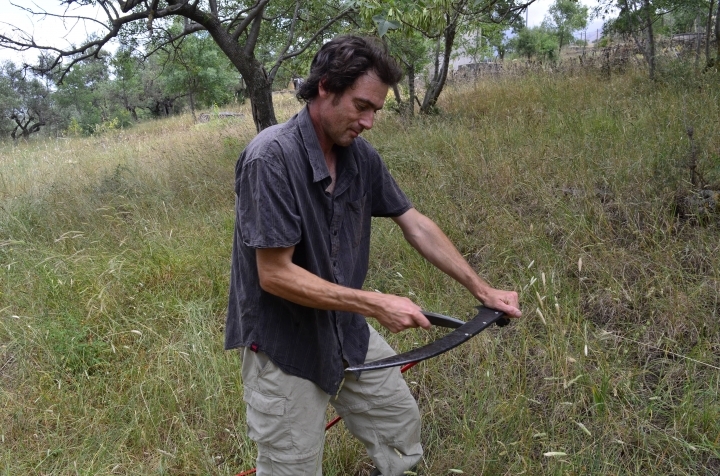 When I told Giovanni Spallina, who runs an agriculture shop in Castelbuono, that I used a scythe, he approved. "The work is better with a scythe," he said. "It comes out better." Sure enough, as we spoke, a farmer showed up at his busy shop, Spallina Natura, with a weed whacker in need of fixing. This year, I've taken a different approach to cutting grass: I decided not to panic about the encroaching sea of grasses and let them grow. Last year, urged by locals and overwhelmed by fast-growing grass, I went out scything in May, in the very heart of flowering — and the experience was excruciating. I suffer from allergies, and after scything for a few hours I'd return to our little farmhouse drenched in sweat and with stinging rashes and welts on my calves and arms. My nose ran without pause, my throat felt like a sandpaper rattle and my eyes were blurry from tears. The same happened this May when I attempted to cut. But then I realized that the grass didn't need to be cut in May. In fact, it is better, local agronomist and naturalist Giuseppe Piro told me, to wait until grasses have reached their maximum growth. 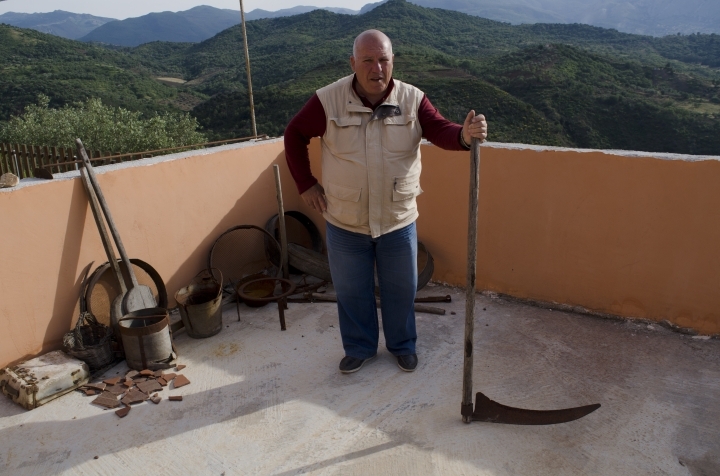 Piro showed me an old scythe among the rusty tools on a property where he makes olive oil with his son. 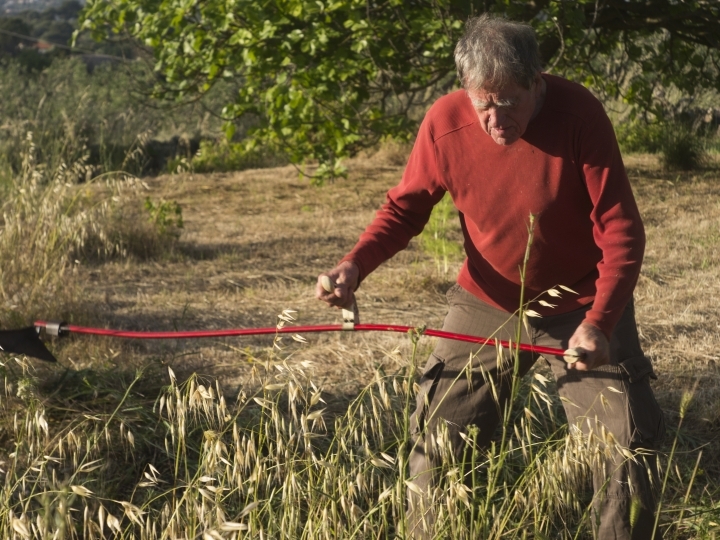 He took the scythe in his hands and demonstrated how old-timers used them, in particular in the higher mountains where vast fields of wheat, barley and other cereals are grown. Sicily was the breadbasket of the Roman Empire. "Look at the blade," he said. He ran his finger along it. "Fifty centimeters. With every stroke, 2 meters by 50 centimeters (of grass) go down." He talked of the ancient culture of cereal cultivation in the mountains, where he worked as a boy. He remembered seeing men, women and children cutting grass by hand and with the help of mules, working through "waves of grass which sway like the ocean." The grasses are used for animal feed and human consumption. Piro said cutters sheathed their fingers with pieces of bamboo to prevent them from getting cut as they used sickles. He remembered how bales of hay were made, how he piloted an ox-pulled sled piled high with hay. As for the machines, he scornfully pointed out patches along the road where one had been used. "When you go with a weed whacker, you destroy the grass. You can't use it for forage," he said. "It's all in pieces." By the end of May, I was ready to start. I'd had a grip put on our scythe by a blacksmith friend. I'd purchased a big straw hat at the market, and sunglasses. My father had visited and given us some tips on how to dampen the whetstones and sharpen the blade. I had loose-fitting clothing and rubber boots. And thus, as the deep quiet of June descended, I waded off into the fields. One stroke at a time, I cut. Sweat beaded on my brow. The slash of the scythe was soothing. Every 10 minutes, I paused to sharpen the blade and listen to summer's sounds.